Le Page Architects were approached in late January 2017 by the Thai Buddhist Community in Plymouth, representing Wat Mahathat Temple UK. 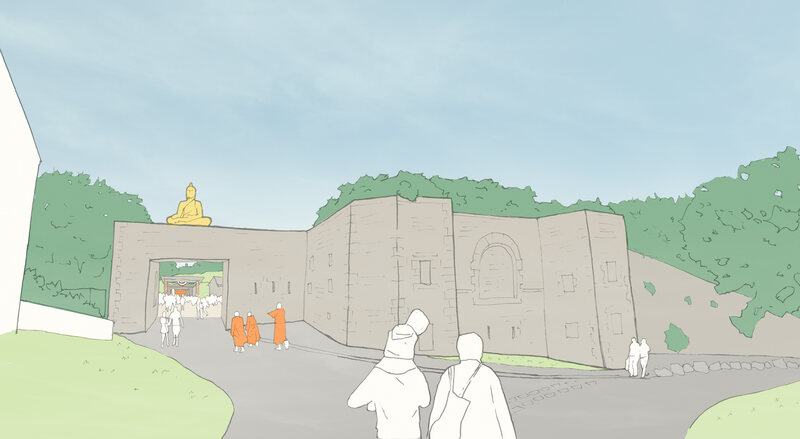 The project under consideration was regarding the possible use of Fort Austin as a new religious base for Wat Mahathat in the South West. Le page Architects were commissioned in March 2017. Fort Austin is a Scheduled Ancient Monument (SAM) – scheduled under the Ancient Monuments and Archaeological Areas Act 1979 as amended, as it appears to the Secretary of State to be of national importance. There are buildings on the site dating from WW2 which have a significance in their own right as well as other modern buildings. A sensitivity analysis was carried out, looking at the existing buildings on the site as informed by historic information. Thorough inspections of the existing buildings followed to give a better view on condition, to inform a repair schedule, sufficient for budget costings. Masterplan options were prepared and are the subject of further discussions with Client, Plymouth City Council and Historic England. The project has now moved ahead and Le Page Architects are working with the clients to secure all necessary consents.